I spent February 6-10 as a volunteer doctor in clinics along the Gulf Coast of Mississippi. I was given a temporary emergency medical license to do so. 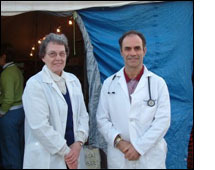 The sponsoring organization was the Lutheran Emergency Disaster Relief Organization, one of the major aid organizations in this area. I worked at three free clinics and saw an average of 45 patients per day. On August 29, the eye of Hurricane Katrina struck just east of Gulfport, MS. The entire coast of southern Mississippi was severely hit. Although the winds of over 125 m.p.h. did a lot of damage, the vast majority of the damage was done by the Gulf storm surge with waves topping out at 50 feet. Many towns, such as Bay St. Louis were entirely wiped out. The business district of downtown Biloxi was severely hit and the gambling casinos, the largest source of revenue and employment were destroyed. In addition to businesses, most homes in and west of Biloxi were destroyed. Ocean Springs, the town where I stayed, is about 15 miles east of Biloxi and less hard hit. Nevertheless, 25% of its homes are uninhabitable. The combination of homelessness from the destruction of housing and unemployment from the destruction of businesses has created both economic and psychological hardship. Five plus months later, the sound of chain saws has been replaced by the sound of hammers. Local residents have seen dramatic improvements, but it may be a decade before things fully return to normal. The medical infrastructure has been decimated. Keesler Airforce base was nearly destroyed. People getting their care at the base have been told to get their care elsewhere. Several emergency rooms were shut down and are just getting opened. Three of the federally qualified health centers for indigent patients were destroyed. An untold number of private doctors' offices were destroyed. Those that have reopened no longer have medical records. Many doctors have moved out of the area, creating shortages of certain specialties. The local VA was functioning, fortunately, as many of our patients could receive testing and medication there. The health care problems encountered can be categorized as acute illnesses, chronic ongoing related health conditions, and Katrina related health issues. The acute illnesses are the usual range of things one might see at a doctor's office or emergency room, including bronchitis, pneumonia, ear infections, and various skin disorders. The predominant Katrina associated illnesses were anxiety, depression, and post traumatic stress disorder. Also common were mold allergy and trauma, usually from non-professionals trying to rebuild homes. The local medical people are very nervous about MRSA, which has been an increasing pathogen in skin infections. There is also a serious vibrio infection of the skin due to polluted water which was present initially but seems to have died down. Chronic illness out of control was rampant. Blood sugars over 400 and BPs over 230/100 were routine.